Remote Oracle DBA Support : What is Oracle Database ? An Oracle Database is a Relational Database management System used to store & retrieve the related information. An Oracle Database server/instance consists of shared memory structure, background processes & storage which handles the functional requirement to manage concurrent & shared data access by users. Oracle database server is a part of multitier architecture includes Client Machine/Webserver, Middleware Application & Database Server. Client is the End user who accesses the DB to retrieve the information. Various ways to access db by client are Sqlplus, Sql developer or other third Party Tools like TOAD/PLSQL Developer, Web URL. Client can be remote or local to DB servers which means that Webserver & Middleware layers are optional & DB can be retrieve from its local server itself. In Complex & Critical Application Setup’s Multitier approach being followed to make efficient administration, security enforcement, patch/upgrades, backup, restoration, monitoring, license management, hardware management of every component. Here it comes the Oracle Database, located on Server supporting any platform like Windows, Solaris, AIX, HP-UX and Linux etc. Will simplify the correlation between each of the basic (writing basic as 8i to 11g various new components being added by oracle but I have picked up the most common of all them & will be easy to understand rather than adding more confusion) database Components & their Usage in following section with reference to above Oracle Basic Architecture with below flow. Memory components are divided into SGA, PGA & UGA based on their functionality, Manageability & types of the process which access them. SGA is System Global Area constitutes the Oracle Instance along with background processes & physical/logical components of the database. SGA is an os shared memory hold by the oracle instance for its various internal memory components. Write List holds all the dirty blocks, means the blocks which are modified by user processes in memory & should be written to DB file back again to retain consistent image of a row/data. LRU list contains two ends, MRU (Most Recently Used) & LRU (Least Recently Used). Dirty blocks held by LRU end of LRU list are being moved to write list. Whenever user process accesses the buffer it has been moved to MRU end of LRU list, mostly fresh/Recently read blocks from data files found in MRU end. Each user process has its private sql area (in shared server mode) & shared sql area stored in shared pool. Large pool was brought in to optimize shared pool by isolating heavy IO servers operation like Backup/restoration using parameter LARGE_POOL_SIZE. Large Pool allocates memory required during disk IO server process operations of Backup & recovery. Java pool memory is used for all session-specific Java code and data within the JVM. The Java Pool Advisor statistics provide information about library cache memory used for Java and predict how changes in the size of the Java pool can affect the parse rate. The Java Pool Advisor is internally turned on when statistics_level is set to TYPICAL or higher. These statistics resets when the advisor is turned off. Redo Log Buffer is circular buffer residing in SGA. It holds redo entries generated due to DB changes. Redo Entries contains information to reconstruct the changes made to database by DML(insert, update,delete) & DDL (alter, create or replace , drop , truncate ) operations. Redo Buffer is flushed to Redo Log files required for Recovery. log_buffer parameter sets the buffer value in SGA, which is not auto tuned by ASMM(Automatic Shared Memory Management). The fixed SGA is a un alterable component of the SGA that varies in size based on platform & release. The fixed SGA contains references to the other components of the SGA and variables that contain the values of various parameters. Its bootstrap section used by Oracle internally to find the other bits and pieces of the SGA. The streams pool is used exclusively by Oracle Streams. It stores buffered queue messages, and it provides memory for Oracle Streams capture processes and apply processes. Initial size of the stream pool set by streams_pool_size parameter & default value is zero. The pool size grows dynamically as needed when Oracle Streams is used. Oracle Flashback feature supports retrieving the historical stat of the db object using Database flashback logs, undo or recyclebin. To support flashback mechanism flashback buffers stores altered/dirty buffers from database buffer before being moved to database flash back logs/disk by RVWR background process (will discuss in later stage). The User Global Area (UGA) is memory resides in OS RAM holds session information like sorts & hash joins of each user process. select name, sum(value/1024) "Value in KB"
PMON is an oracle background process called process monitor. PMON is responsible for service registration to listener which avoids manual configuration of service in listener.ora file by supplying information like database/instance name & its current/maximum load, dispatcher/server mode (shared/dedicated) info. SMON is system monitor process. SMON is responsible for performing instance recovery during startup of DB post abrupt shutdown/termination of instance. SMON cleans up temporary segments that are no longer in use and recovers dead transactions which were skipped during system failure/instance recovery because of file-read errors or offline file status. Such transactions are recovered by SMON when the tablespace or data file is brought back online. The initialization parameter DB_WRITER_PROCESSES specifies the number of DBWn processes. It writes modified blocks from the database buffer cache to the datafiles. - A DBWn timeout occurs (every 3 seconds). - A normal or incremental checkpoint occurs. - The number of dirty buffers reaches a threshold value. - A process scans a specified number of blocks when scanning free buffers and cannot find any. - A normal or temporary tablespace is placed offline. - A tablespace is put into read-only mode. - A tablespace is dropped or truncated. Modified or new data is not necessarily written to a datafile immediately. To reduce the amount of disk access and to increase performance, data is pooled in memory and written to the appropriate data files all at once (in bulk mode), as determined by the background process database writer process (DBWn). The disk write can happen before or after the commit. After a COMMIT, the database writes the redo buffers to disk but does not immediately write data blocks to disk. Instead, database writer (DBWn) performs lazy writes in the background. The redo log buffer is circular. When LGWR writes redo entries from the redo log buffer to an online redo log file, server processes can copy new entries over the entries in the redo log buffer that have been written to disk. LGWR normally writes fast enough to ensure that space is always available in the buffer for new entries, even when access to the online redo log is heavy. The atomic write of the redo entry containing the transaction's commit record is the single event that determines the transaction has committed. Oracle Database returns a success code to the committing transaction although the data buffers have not yet been written to disk. The corresponding changes to data blocks are deferred until it is efficient for DBWn to write them to the data files. LGWR can write redo log entries to disk before a transaction commits. The redo entries become permanent only if the transaction later commits. When activity is high, LGWR can use group commits. For example, a user commits, causing LGWR to write the transaction's redo entries to disk. During this write to disk LGWR can write the list of redo entries of waiting transactions for other user processes (not yet committed) in one operation instead of performing IO followed by every user process commit. In this way, the database minimizes disk I/O and maximizes performance. If commits requests continue at a high rate, then every write by LGWR can contain multiple commit records. LGWR writes synchronously to the active mirrored group of online redo log files. If a log file is inaccessible, then LGWR continues writing to other files in the group and writes an error to the LGWR trace file and the alert log. If all files in a group are damaged, or if the group is unavailable because it has not been archived, then LGWR cannot continue to function and DB hangs. -An online redo log switch occurs. -Three seconds have passed since LGWR last wrote. -The redo log buffer is one-third full or contains 1 MB of buffered data. -DBWn must write modified buffers to disk. a) Every dirty block in the buffer cache is written to the data files. b) The latest SCN is written (updated) into the datafile header. c) The latest SCN is also written to the control files. Note: redo log switches cause a checkpoint, checkpoints don't cause a log switch. 2. At the time of log switch - Sometimes log switches may trigger a complete checkpoint, if the next log where the log switch is to take place is Active. In Complete Checkpoint, checkpoint information is written in control file, datafile header and also dirty block is written by DBWR to the datafiles. Full Checkpoint happens in the following cases. 3. Some log switches may trigger a complete checkpoint , if the next log where the log switch is to take place is Active. This has more chance of happening when the Redo Log files are small in size and continuous transactions are taking place. Partial Checkpoint happens in the following cases. 3. before placing tablespace in read only. 5. before taking datafile offline. 6. When checkpoint queue exceeds its threshold. 7. Before segment is dropped. 8. Before adding and removing columns from table. An Oracle instance can have up to 10 ARCn processes (ARC0 to ARC9). The LGWR process starts a new ARCn process whenever the current number of ARCn processes is insufficient to handle the workload. The alert file keeps a record of when LGWR starts a new ARCn process. Dynamic LOG_ARCHIVE_MAX_PROCESSES can be set to max 10. Starting from one ARCn process oracle automatically starts up more ARCn processes till LOG_ARCHIVE_MAX_PROCESSES when the database workload requires more. The Recovery Writer process is responsible for writing to the flashback logs in the flash recovery area. MMON gathers memory statistics (snapshots) stores this information in the AWR (automatic workload repository). MMON is also responsible for issuing alerts for metrics that exceed their thresholds. MMNL is a Memory Monitor Light background process that assists the MMON process. This process will flush the ASH buffer to AWR tables when the buffer is full or a snapshot is taken. CJQn is a Job Queue background Process. Oracle Database uses job queue processes to run user jobs, often in batch mode. A job is a user-defined task scheduled to run one or more times. For example, you can use a job queue to schedule a long-running update in the background. Given a start date and a time interval, the job queue processes attempt to run the job at the next occurrence of the interval. The job coordinator process (CJQ0) is automatically started and stopped as needed by Oracle Scheduler. The coordinator process periodically selects jobs that need to be run from the system JOB$ table. New jobs selected are ordered by time. TRUE if value default and not changed since instance creation. 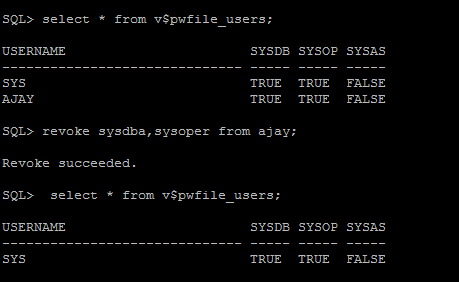 FALSE — can only be changed when a SPFILE is used, you need to bounce the instance. It is related to RAC. If this value is set to ‘TRUE’ for a parameter, it means that there can be different value of the same parameter in different instance in RAC. If the value is set to ‘FALSE’, it means that particular parameter should always have the same value in all RAC instances. If issys_modifiable value is ‘FALSE’ for the specific parameter then ISINSTANCE_MODIFIABLE is always ‘FALSE’ for the same parameter. If the DBA wants to startup a stopped oracle instance whose database dictionary is not accessible how oracle would authenticate the DBA? This will allow authentication of the DBA to happen outside of the database either using password file or through the operating system (sqlplus “/ as sysdba”) from oracle owner. The init parameter remote_login_passwordfile specifies if a password file is used to authenticate the DBA or not. If it set either to shared or exclusive a password file will be used. The default location for the password file is: $ORACLE_HOME/dbs/orapw$ORACLE_SID on Unix and %ORACLE_HOME%\database\PWD%ORACLE_SID%.ora on Windows. Complete file name path to be specified along with name e.g. FILE=/u01/app/ora11g/product/11.2.0/dbhome_1/orapwMYDB. The contents of this file are encrypted. If set to Y, overwrite an existing password file. If set to y, passwords are case-insensitive. If not set or set to N password is case-sensitive. NONE: Oracle Database to behave as if the password file does not exist. That is, no privileged connections are allowed over nonsecure connections. EXCLUSIVE: (default) An EXCLUSIVE password file can be used with only one instance of one database. It enables to add, modify, and delete users & to change the SYS password with the ALTER USER command. SHARED: A SHARED password file can be used by multiple databases running on the same server, or multiple instances of an Oracle Real Application Clusters (RAC) database. A SHARED password file cannot be modified. This means that you cannot add users to a SHARED password file. 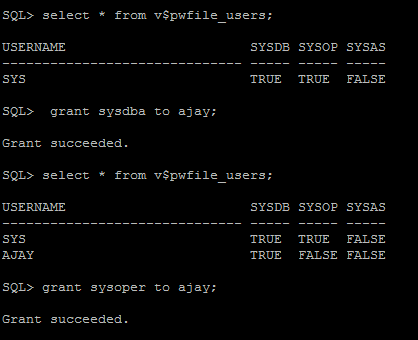 Any attempt to do so or to change the password of SYS or other users with the SYSDBA or SYSOPER privileges generates an error. All users needing SYSDBA or SYSOPER system privileges must be added to the password file when REMOTE_LOGIN_PASSWORDFILE is set to EXCLUSIVE. After all users are added, you can change REMOTE_LOGIN_PASSWORDFILE to SHARED, and then share the file. This option is useful if you are administering multiple databases or a RAC database. If REMOTE_LOGIN_PASSWORDFILE is set to EXCLUSIVE or SHARED and the password file is missing, this is equivalent to setting REMOTE_LOGIN_PASSWORDFILE to NONE. tnsnams.ora is a configuration file mostly required by clients (but located on both client & Server) connecting to DB for resolving the connection specification which contains net service names mapped to connect descriptors or net service names mapped to listener protocol addresses. The "sqlnet.ora" file contains client side network configuration parameters located at "$ORACLE_HOME/network/admin" or "$ORACLE_HOME/net80/admin" directory on the client. This file will also be present on the server if client style connections are used on the server itself. Here is an example of an "sqlnet.ora" file. Ldap Set to resolve a database service name, net service name, or net service alias through a directory server. cds Set to resolve an Oracle database name in a Distributed Computing Environment (DCE) environment. Nis Set to resolve an Oracle database name in a Distributed Computing Environment (DCE) environment. SQLNET.AUTHENTICATION_SERVICES used to enable one or more authentication services. If authentication has been installed, it is recommended that this parameter be set to either none or to one of the authentication methods. NONE for no authentication methods. A valid username and password can be used to access the database. The control file must be available for writing by the Oracle Database server whenever the database is open. It is being read/written in Mount stage. Without the control file, the database cannot be mounted. Datafiles are physical files stored on disk which consists of User, System, Undo segments. Database datafiles are only written to by the DBWR processes that we introduced you to earlier. These database datafiles are associated with Oracle “Tablespaces”, which are “logical” containers for tables and indexes. Temporary tablespaces are used to manage space for database sort operations and for storing global temporary tables. For example, if you join two large tables, and Oracle cannot do the sort in memory, space will be allocated in a temporary tablespace for doing the sort operation. Other SQL operations that might require disk sorting are: CREATE INDEX, ANALYZE, Select DISTINCT, ORDER BY, GROUP BY, UNION, INTERSECT, MINUS, Sort-Merge joins, etc. Archive log files are historical image of online redo log file. Thanks ajay for uploading the architecture in detail...very useful explanation..
Ajay, May I get this in a PDF or word file please..? Sir, pls send that video clip to my email I.D. It will certainly be aid ful 2 make pcb easy. wow! very nice work. I'm looking for this. Very good info. Can I get the PDF format of the above bd architecture.